Bone shaped pedal board with bag and velcro. Suit DJ, Laptop, sequencer, vinyl junkie, pet lizard style arrangement. An enormous pedal case. Internal dimensions 107 x 38 x 11cm. w/ power boards and custom solder free patch cables. Raised platform. READY TO ROCK! Pedal case with detachable lid. In cool tweed! 55 x 31 x 9 cm internal dimensions. 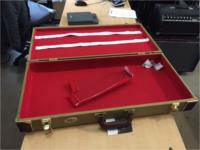 Vintage Style Pedal Road Case with removable lid! Deluxe Tweed Covering! 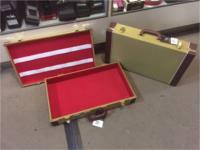 Internal dimensions - 70cm x 32cm x 9cm RRP $99 - SWOPPY PRICE of $89! Internal dimensions = 40 x 35 x 42 cm. Includes locks and key! Enter your email address below to get alerts for Storage/mic/pedal cases.